“Well, it was a new town. Maybe I’d get lucky. The rain stopped and the sun came out.” These are the thoughts of Henry Chinaski as he navigates himself around America in search of work and on the ‘beating’ track of writing. Beat is the key word in this, as Bukowski is considered to be one of the beat writers; just like many of his predecessors, he travels across America as seen in Kerouac’s On the Road. Bukowski’s language and outlook on life, just as Kerouac’s is poetic, harsh and stripped down to the bare ugly truth at times. Henry Charles Bukowski (1920-94) was a novelist, poet and a short story writer who grew up in LA and was famously referred to as “the 64-year-old Los Angeles-based laureate of American lowlife” by Pico Iyer for the “Time” magazine in 1986. 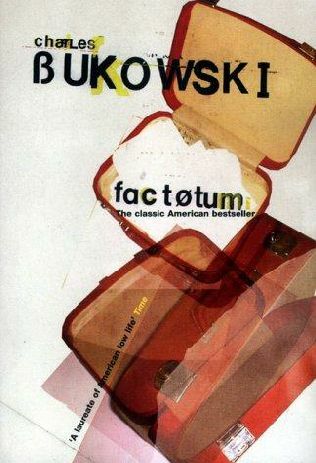 Factotum was his second novel, published in 1975, according to the oxford dictionary, the definition of factotum is thus so; “a servant or assistant who does all kinds of work” and this is what the novel is about. Bukowski’s alter-ego, Chinaski, is excluded from the army during World War II on the bases of his medical and is left behind tracing the land in search of work, any work, and getting involved in all sorts of strange situations. The novel is rapid in movement as we glide from one situation and one State to the other, meeting incredible characters along the way. As he plods along with his torn suitcase which he tries desperately to cover with black shoe polish, it begins to rain. It’s not long before we can see that the truth can not be hidden as nature has a cruel way of washing and exposing life for what it really is, and the last laugh is bound to be on him as it rubs off onto his trousers as he seeks housing in the poor quarters. Chinaski desires to be an outsider, for some this is a lonely state to be in, however, for the likes of Chinaski it is a form of heaven. There is constant imagery of Chinaski entering a building as others are exiting conjured up, and in the depths of such a solitary life, there is no such thing as camaraderie as there was in On the Road. The situations Chinaski finds himself in are entertaining to say the least, but what the novel has is a firm and fantastic grip on language; it is the language that one can not ignore as it jolts us and keeps us upright. His words are succinct and have no intention of fooling its reader; with such coherent directness the impact is fast and furious as well as poignant, graphical and a part of the “no” nonsense school of thought. Chinaski declares that he is a writer, yet we never see him pick up a pen. He is a man of many vices, whether its drinking, or women, he appears to be the happiest when he is left alone, forever wondering, refusing to grow any roots, yet this is somewhat untrue as he finds himself returning to his home town, LA. This confessional masterpiece offers a great insight into a mind that allows us to see all, embracing the ugliness of alcoholism and the general state of the world during the time of war and depression. As Chinaski walks out of the jail house for the fifth time or so, he continues onto the next adventure, it may resemble the previous catastrophic one, but it doesn’t matter, the point is, he just keeps going on.